No.43 Italian Bistro is an established Italian restaurant located at the Cape House serviced apartments building on Soi Langsuan. Opened in 1998, the restaurant is popular for its fine selection of Italian dishes and home-made pastas & pizzas prepared by skilled Italian chefs, and also their delectable desserts. Most of us would not know that this eatery also boasts of a lunch buffet every day of the week, well-liked by the office crowds due to its bargain price. The daily lunch buffet has a wide selection of Italian dishes, a live pasta corner, a salad bar, several Thai dishes, an endless selection of cakes and desserts, ice-cream, hot coffee and tea. 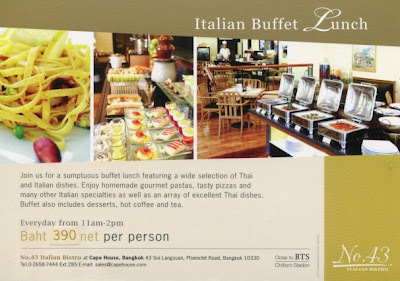 The buffet has been priced at the unbelievable rate of 350 Baht net per person, but is increasing in price from April 2012 after many years to 390 Baht, which is still a steal considering the variety of delicious and high quality food and desserts. The lunch buffet timings are from 11:00 to 2:00 pm. The restaurant is easily accessible from the BTS, being a mere ten-minute walk down Soi Langsuan from Chidlom BTS station. Besides lunch, the restaurant also has buffet breakfast at 348 Baht net from 6 am to 10:30 am.